ICE BLUE'S BEHIND ENEMY LINES "LUCY"
Red was a rescue and started my love for the breed. She was difficult compared to my 2 shelties, but I loved the free spirit, intelligence and independence. Thank you, Red. We called her Grandma Lucy, she only produced one litter for Rhonda Weaver and then came to us with her daughter "Kitty". Lucy loved everyone and especially puppies! 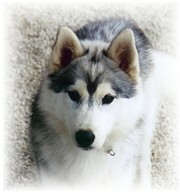 She was our puppy raiser until we lost her in 2008 due to renal failure, rest well we will miss you! Frankie was our first show dog and Lucy's brother. JR and I attempted to show him, but we were such novices, that we really didn't know what we were doing. Tommy O. handled him to a group 4 at the WPKA show. Tommy O. and Marlene of Kontoki also became our great friends and the best mentors a newbie could have. Until his last days, Frankie was very sweet and proud. He had the best temperament. He participated in parades and childrens education. We lost him in 2008 to prostate cancer. Rest well my dear friend. 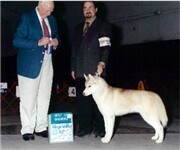 Ace (4/4/2000- 12/05/08) was our first champion. His points were all owner handled. We lost him to hemeangiosarcoma. He sired a litter by Ch. 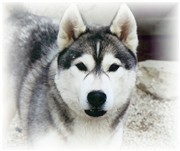 Kontoki's Jenny From the block producing 3 champions (Ch. Diamondt's The Razor's Edge, Ch Diamondt's Thunder Struck and Ch. Diamondt's Who Made Who) and 1 major pointed (Diamondt's Back In Black). Ed and Maddie are both group placers! He also has 1 champion grandson "Aden" CH Diamondt's Sharp Dressed Man. Striker was the most willing dog. 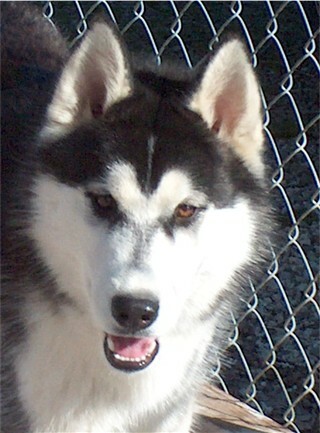 He trained in agility and obedience and obtained his CGC with ease. 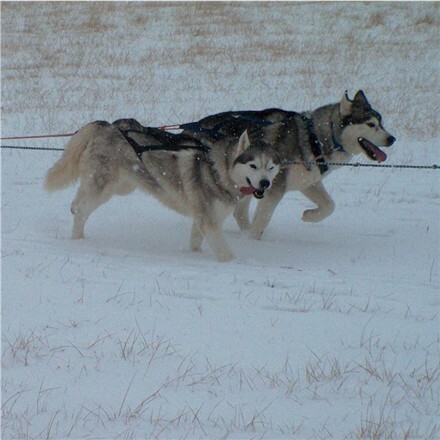 He ran on the team originally in the wheel position and then proved to be one awesome lead dog! We lost him in 2012 to a stroke. He was Tyler's best bud and is very missed. Kitty was a sweet girl. 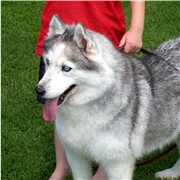 Who produced our first champion Diamondt's Ace in The Hole "Ace", making her the grandmother of 3 AKC champions. 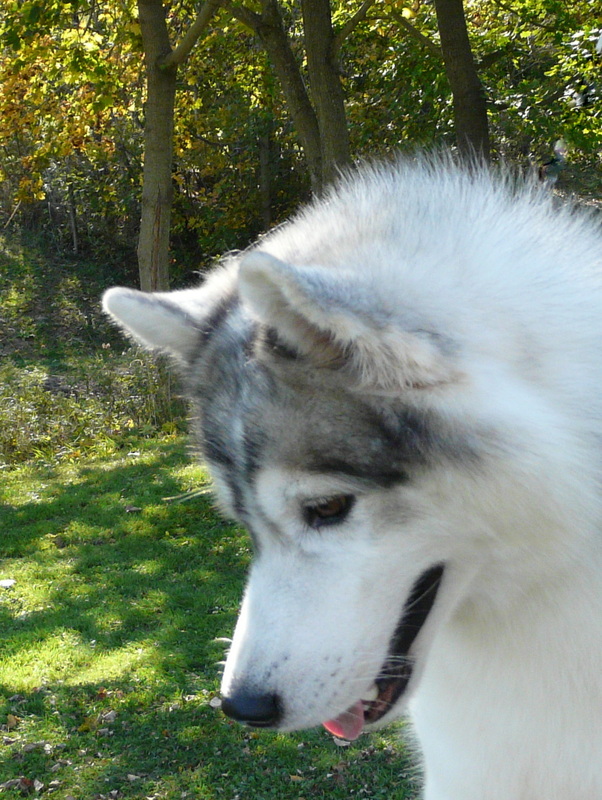 She is pictured below with her son "Ace"
J-Lo is one of the founding ladies of Diamond T Siberians. We can't thank Marlene & Tommy O. of Kontoki enough for entrusting us with this special girl. She finished her championship easily and produced beautiful children. She is the dam of Ch.Diamondt's Comin' On Strong, Ch Diamondt's Nobody But Me, Ch Diamondt's Who Made Who, Ch. Diamondt's The Razors Edge, CH Diamondt's Thunder Struck, CH Diamondt's Back In Black and the grand dam of Ch Diamondt's Sharp Dressed Man, CH Diamondt's The Sound of Madness and CH Diamondt's BBBBBad To The Bone. Her beauty and structure will live on at Diamond T in her children and grandchildren. Love you J-Lo! Blake was fabulous wheel dog. He was always willing to work and finished his AKC championship from the Bred-By Exhibitor class handled exclusively by Shawna. He was truely her dog. He will live on through his children. KONTOKI'S HEY DIDDLE DIDDLE "HILLARY"
Hillary was the sweetest girl ever and is the dam of our first 2 bred-by exhibitor champions Marky & Mikey. She will be forever missed by the whole family and she will live on through her children and grand children. She is the dam of AKC CH Diamondt's Cat N' The Fiddle and AKC CH Diamondt's Over The Moon, grand dam to AKC GCH Diamondt's Sharp Dressed Man & Great Grand Dam to CH Diamondt's BBBB Bad To The Bone.